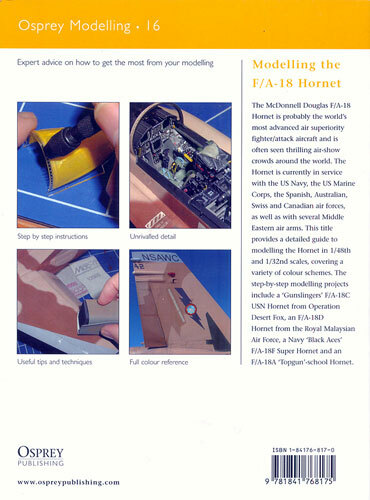 This new publication in the Modelling Series from Osprey (number 16) covers the Mc Donnell-Douglas F/A-18 Hornet. I always look forward to new releases in the Modelling Series but was especially pleased to learn that the next volume was to cover the F/A-18 Hornet as I am a fan of US Naval aviation. The wait was long but well worth it as Geoff Coughlin has done a sterling job with this one. The book comprises 82 glossy pages measuring 243mm x 185mm between cardboard covers and is well illustrated with 102 colour photographs of both the models being built and of one-to-one-scale Hornets. The photographs are great "modelling type" ones – read sharp, clear, and up-close. The book is divided into nine chapters as well as a handy index. It kicks off with an introduction followed by a chapter on tools and materials. The latter chapter covers or more succinctly, reinforces the basics of modelling before you are launched into the book proper. With this out of the way the following five chapters cover the builds of five different kits of the Hornet. · 1/48 scale Hasegawa F/A-18C. This kit is built up as machine from VFA-105 'Gunslingers' during Operation Desert Fox in 1999 using Eagle Strike decals and an Eduard etch metal set. · 1/32 scale Academy F/A-18C. Built as a VFA-86 'Sidewinders' aircraft also using Eagle Strike decals, Re-heat etch metal belt buckles, and an M.V. Products light set. · 1/48 Scale Hasegawa F/A-18D. Built as a Royal Malaysian Air Force machine using a Black Box resin cockpit set, Eduard placard set/remove before flight tags and F-4dable Models decals. · 1/48 scale Italeri F/A-18F. Built as a 'Black Aces' VFA-41 bird using the Black Box resin cockpit set, Eduard placard set/remove before flight tags and M.V Products clear lenses for the nose gear and right fin tip. · 1/32 scale Academy F/A-18C kit built as an F/A-18A of NSWAC Fighter Weapons School. Geoff converts the kit to –A standards as well as using the Cutting Edge's resin cockpit set and exterior update set, Eduard placard set and M.V Products clear lenses for the nose gear. Decals for this build are by Two Bobs. The remaining chapters provide suggestions for diorama/display bases and how to effectively paint and weather your scale Hornet. Available F/A-18 kits, references and websites round out the book. All up a nice little package. Well written, well illustrated and right up to date. A downside? Yes, there are no 1/72 scale kits featured. 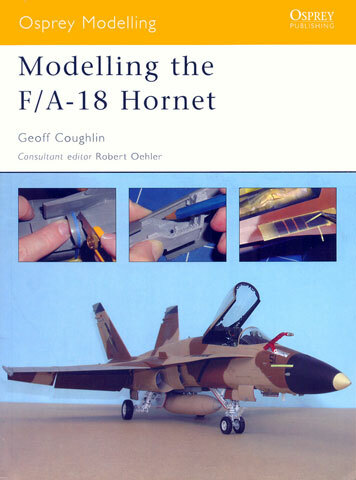 Weather this is a conscious decision by the author or not I don't know but I would suggest that if the title is "Modelling the F/A-18 Hornet" and the focus of the book is plastic modelling, I'd expect to see a couple of 1/72 scale kits included. The book might not appeal to the "hard bitten" modeller who right clicks and saves every mention made of modelling F/A-18s that appears on the net. It is, however, well worth a place on the shelves of the average modeller.